In transfer molding, raw rubber is placed in a reservoir, which is called a transfer pot. The rubber is then forced by a hydraulically actuated ram into pre-heated mold cavities and through a series of sprues. The required heat to facilitate vulcanization comes from the mold itself as well as the process of forcing a viscous liquid (the rubber) through small passages. The result is a high viscous, hot compound which flows easily and cures quickly, and in the process increases molding efficiency. What’s more, because the rubber is forced into the closed mold, the resultant flash is far less significant than it would be in compression molding. 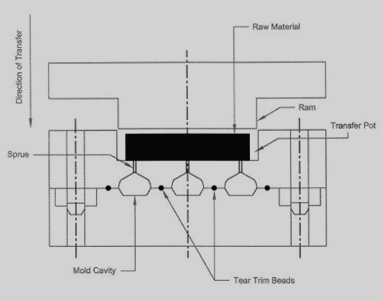 Transfer molds are more complex than compression molds, which makes the mold costs substantially more. Also, there is typically more material waste produced with transfer molding. However, transfer molds can frequently be run in the same hydraulic presses used in compression molding. J Royal routinely conducts transfer molding when bonding rubber to metal.